No, Doing That "Be Like Bill" Quiz On Facebook Does Not Make You Smart. Here's Why. 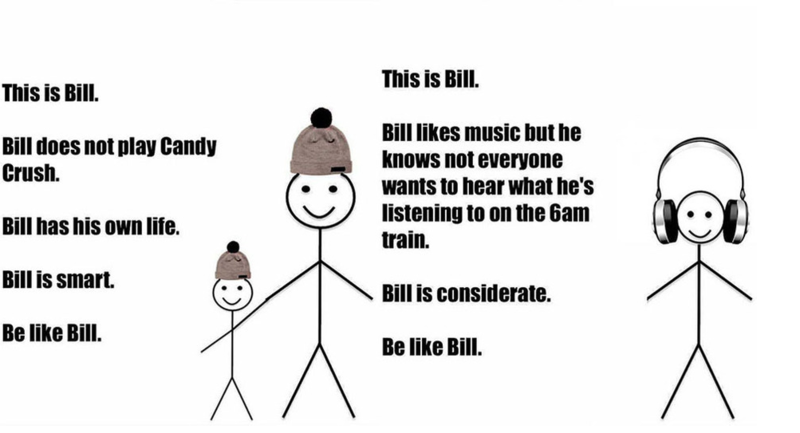 If you spend any amount of considerable time on social media like Facebook, Twitter or Instagram, then you might have ran into the now viral and borderline irritating “Be Like Bill” memes. In this scenario, Bill isn’t a wealthy, intelligent, tech-savvy and a philanthropic, white guy neither is he the guy that Sun Ho was singing about, but rather the Internet’s beloved stickman that embodies the quintessential qualities that the modern-day individual should possess on social media. Bill is way too polite, loving, and politically correct to ever show up at your doorstep and ask you to stop doing something irritating. Nope, that’s not like Bill. Bill goes the extra mile and he leads by example. Yes, Bill goes to the gym, works out but he NEVER posts pictures of his workouts on social media accompanied with motivating (not) hashtags. He doesn’t do this because he’s the buffest one in the room or because he doesn’t look anything like a person that works out, he is a stickman after all. Bill doesn’t post his pictures online because Bill is smart, hence, you should be more like him. There are many other variations of this meme but the premise of every single meme is that Bill is smart and that you should try and emulate him. 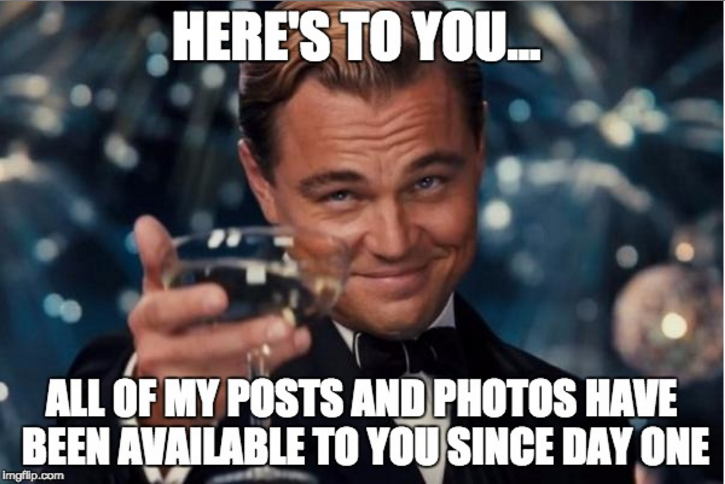 Although this meme has recently gained popularity, there’s nothing new about them. 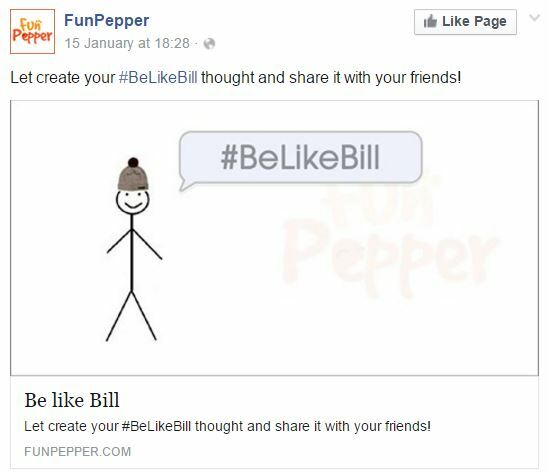 In fact, they first began appearing online late last year, and they were pushed to the forefront of popularity by a Facebook page that has more than 1.3 million likes called “Be like Bill”. The Be Like Bill memes are so popular right now, that BBC Trending tracked down the man behind the page, Eugeniu Croitoru. Describing himself as an Internet entrepreneur, he told BBC, “The idea is very simple. ‘Bill’ can be anyone who is smart and has common sense and doesn’t do annoying things. You’ll also notice Bill can be someone who makes fun of himself and jokes about others too occasionally.” He also highlighted that he isn’t making any money out of the concept at the moment but he hopes to do so in the future. Given that Bill is the closest we as humans will ever get to perfection, numerous Facebook quizzes like this one have popped up online to capitalise on people’s urges to fit in and to be on the right side of the fence. Fun Pepper for example, let’s you answer a couple of questions and then creates a meme similar to the Be Like Bill meme. People fill these quizzes up with excitement and post it up on their profiles, as a very passive aggressive way to gain moral superiority and to subliminally state that you should indeed be like them (but little do they realise that no one wants to be them because they aren’t from the Kardashian pack). Also, people willingly hand over their private information to third parties, without having an idea about how they operate because they simply don’t read the privacy statements those apps, games and quizzes often have. 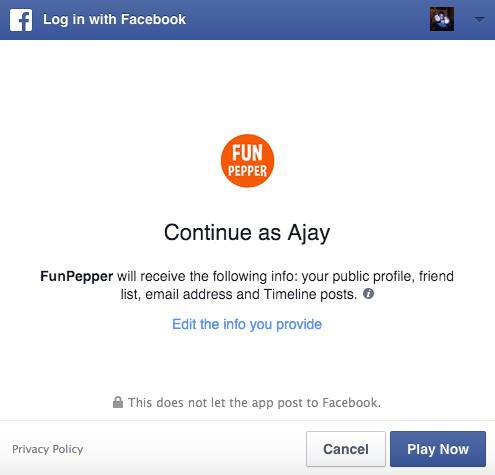 Fun Pepper, for example, gathers information such as your public Facebook profile, your email address, interests, likes, education history, relationship interests, current city, information about and photos of your Facebook friends, and so much more. They also gather information about your location based on your device, and by using Fun Pepper you’re essentially giving the platform the right to collect and store any personal information related to you. Granted that you might not hand over all of the sexting that you sent strangers over Tinder by playing this quiz, it still doesn’t erase the fact that you gave them the right to access such information if need be. Also, their privacy statement states that even if you close your account with them (if you have one), they will still retain certain information related to your account. Now, this isn’t the only platform that gathers all this information from your social media accounts to sell to third parties, as there are so many others that do. Another more recent example is the hordes of people who used another quiz about the words that they’ve frequently used on Facebook. If you’d like an idea of how many apps have access to your information, you can head over to the Settings page on Facebook and navigate to the Apps tab, to have a look at all apps. 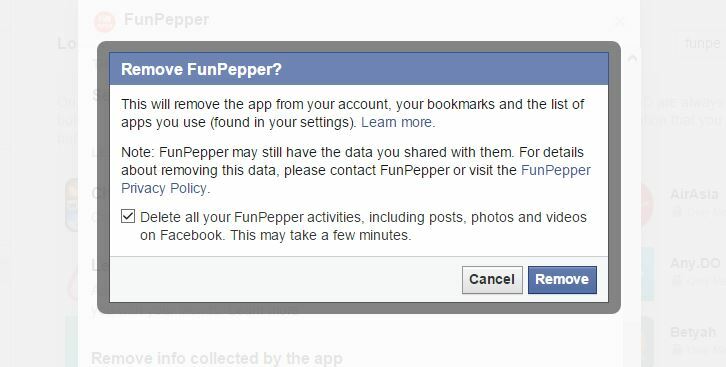 You can then disallow them from having accessing your Facebook account. Also keep in mind that once platforms gather information about you, it’s practically impossible to get them to delete all your data. It’s practically theirs forever. So the next time you give an app access to your Facebook account, do take note of what they’re likely to use the information for.